Big brother continues his encroachment on our freedoms with the installation of surveillance cameras across our cities. Las Vegas is even installing Wi-Fi-ready lampposts that stream passers-by localized information, complete with audio and graphics. In addition to broadcasting this information, the lampposts are equipped with microphones and cameras that can record anything within an earshot and send it to a server to be analyzed. Looks like what happens in Vegas no longer stays in Vegas. Mass surveillance isn’t something only being conducted by the likes of the National Security Agency anymore. 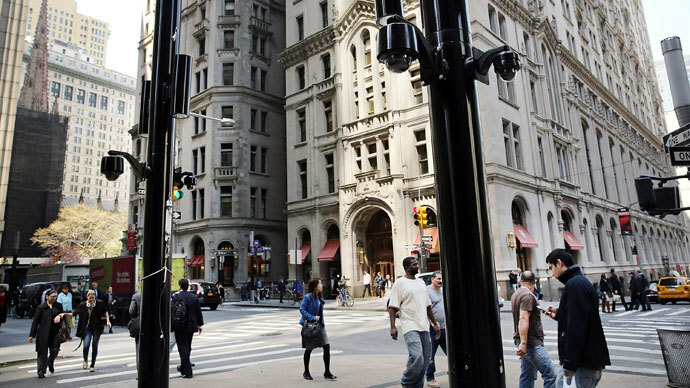 Despite growing concerns brought on by the Summer of Snowden, cities around America are adopting high tech spy tools. Never mind the negative press the NSA has received in recent weeks after Edward Snowden began leaking top-secret documents to the media pertaining to the United States’ spy group’s broadly scoped surveillance programs. Law enforcement agencies and local leaders in major American cities are nevertheless signing on to install new systems that are affording officials the power to snoop on just about anyone within range. Seattle, Washington and Las Vegas, Nevada are among the latest locales in the US to acquire surveillance tools, the likes of which were both discussed in regional media reports over the weekend that are making their rounds across the Web and causing privacy advocates around the world to raise their voice. Neither West Coast city has announced plans to acquire telephone metadata or eavesdrop on email traffic, and combined their operations likely pale in comparison to what the NSA has accomplished. Civil liberties activists are sounding the alarm regardless, however, after new reports revealed what kind of information city officials could collect using newly installed equipment. In Seattle, a city of around 635,000, the police department recently used a Department of Homeland Security grant for $2.6 million to purchase and put up a number of wireless access devices that together create “mesh networks” which law enforcement officials can connect to and in turn more quickly share large chunks of data, such as surveillance camera recordings and other high-res information. Those access points, or APs, do more than just transfer data from one node to another, though, and actually spend large amounts of time scouring for every Internet-capable device in the area that may be searching for a Wi-Fi signal — such as any smart phone that can connected to the Web. Although the mesh network is being made for emergency responders to be able to interact with ease and provide them with a widespread wireless system to share information, the APs acquire basic information about every electronic device that even momentarily makes a connection with, in theory allowing officials to see much more than the average Washingtonian might want to willfully hand over. The Stranger, a Seattle alt-weekly, spoke to the city’s police department about the recently installed mesh network but wasn’t awarded many answers. Law enforcement officials insisted that the system isn’t fully functioning yet — and little more — but the Stranger learned that authorities can log the MAC (media access control) address of any iPhone, Android, laptop or Internet-able device that’s within reach of its signal, which could then provide authorities with information that even a seasoned investigator might have a hard time obtaining otherwise. Just as how telecommunication companies ping devices almost constantly from nearby towers to test signals, learning the specific location of a MAC address at any given date and time can then be coupled with other location data in order to triangulate a subject’s movements up to even just a few inches away. Speaking to the Stranger, the Seattle Police Department admitted it does not yet have a policy to govern the use of the multi-million dollar system, but said it is “actively collaborating” with the American Civil Liberties Union, contrary to claims made by the ACLU that the SPD has been anything but speedy when responding to its questions and concerns.